Here’s a look at Boko Haram, a militant Islamic group working out of Nigeria, whose purpose is to institute Sharia, or Islamic law. Boko Haram does not engage in Nigeria’s political system out of an adherence to a fundamentalist form of Islam, which forbids participation unless the system is based on Sharia, or Islamic law. 2002 – The group, which may have existed since the late 1990s, organizes under the Muslim cleric Mohammed Yusuf. It is centered in Maiduguri, the capital of the northeastern state of Borno. December 2003 – The first known attack by Boko Haram includes roughly 200 militants, who attack multiple police stations in the state of Yobe, near the Niger border. July 2009 – The Boko Haram uprising begins in Bauchi and spreads to the states of Borno, Kano and Yobe. The militant group kills scores of police officers. A joint military task force responds, leaving more than 700 Boko Haram members dead and its operational mosque destroyed. The uprising ends when police capture the group’s leader. His deputy, Abubakar Shekau, reportedly dies in the uprising. Yusuf later dies in police custody. Police say he is shot during an attempted escape, but Boko Haram claims it is an extrajudicial execution. 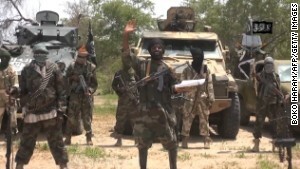 July 2010 – Boko Haram releases a video statement in which Yusuf’s deputy who allegedly died the previous year, Shekau, claims to be the leader of the group. September 7, 2010 – In the state of Bauchi, 50 Boko Haram militants attack a prison, killing five people and releasing more than 700 inmates. May 29, 2011 – The day of President Goodluck Jonathan’s inauguration, Boko Haram detonates three IEDs near a military barracks in the city of Bauchi in Bauchi State. At least 10 people die in the attack. August 25, 2011 – Twelve people die after Boko Haram militants attack a police station and two banks in the city of Gombi in Adamawa. August 26, 2011 – Boko Haram attacks the United Nations compound in Abuja. A car bomb kills 23 people and injures more than 75 others. November 4, 2011 – More than 100 die in multiple attacks in Yobo, Damaturu and Borno states. Boko Haram militants utilize IEDs and vehicle-borne IEDs to target security forces and their offices, markets and 11 churches. January 2012 – A newly formed splinter group, known as Ansaru, announces Abu Usmatul Al-Ansari as its leader. January 20, 2012 – More than 200 people are killed when Boko Haram launches coordinated attacks targeting police, military, a prison and other targets in the city of Kano in Kano State. February 19, 2013 – Militants alleging to be Boko Haram kidnap a French family of seven in a national park in northern Cameroon; however, the affiliation with Boko Haram cannot be verified. The family is later released. April 19, 2013 – Boko Haram battles with multinational security forces from Niger, Nigeria and Chad in the city of Baga in Borno State, leaving nearly 200 people dead, including many civilians. Shekau releases a video in May saying Boko Haram is not responsible for the civilian deaths. June 4, 2013 – President Jonathan approves the proscription of Boko Haram and splinter group Ansaru as terrorist organizations. June 2013 – Boko Haram targets churches in various states on three Sundays in a row, leaving more than 50 people dead. August 14, 2013 – The Ministry of Defence announces the death of Boko Haram’s second-in-command, Momodu Baba (known as Abu Saad). August 19, 2013 – Nigeria’s chief army spokesperson claims Shekau may have died after an attack on June 30, but the claim is never verified. September 17, 2013 – Boko Haram gunmen dress in military uniforms and stage a fake checkpoint near Benisheik in Borno, burning vehicles and executing travelers, leaving at least 143 people dead. September 25, 2013 – A man claiming to be Shekau appears in a video and says that he is alive and well. However, his identity is not verified. November 13, 2013 – The US State Department adds Boko Haram and Ansaru to its list of terrorist organizations. January 26, 2014 – At least 45 are killed in a market in Kawuri in Borno after Boko Haram militants open fire. February 11, 2014 – At least 23 people are killed when suspected Boko Haram militants torch houses in the village of Konduga, according to the governor of Borno state. April 14, 2014 – Boko Haram militants kidnap approximately 276 teenage girls from a boarding school in Chibok in Borno. Officials there say some of the girls were able to escape. The kidnapping sparks global outrage and a #BringBackOurGirls campaign on social media. May 13, 2014 – Hundreds of Boko Haram militants storm three villages in the state of Borno. Villagers resist, killing more than 200 Boko Haram fighters. May 20, 2014 – Twin blasts in the city of Jos kill 118 people at a market. Nigerian authorities describe the blasts as “terrorist activities” but decline to speculate on who might be responsible. May 21, 2014 – The White House announces that the United States has sent 80 troops to Chad to help search for the kidnapped schoolgirls. May 22, 2014 – The UN Security Council adds Boko Haram to its sanctions list. June 3-4, 2014 – Hundreds of people are killed in raids by Boko Haram Islamic militants in the state of Borno, with some sources putting the death toll at 400 to 500. June 7-8, 2014 – Suspected Boko Haram militants kidnap at least 20 young women over a weekend in the northeastern Nigeria village of Garkin Fulani, eight kilometers from a town where more than 200 schoolgirls were taken nearly two months earlier. June 18-22, 2014 – Boko Haram militants hold the village of Kummabza in Borno state, northeastern Nigeria, hostage for four days. They abduct more than 60 females, including children, and kill 30 men in the raid. July 7, 2014 – Sources say at least 57 girls kidnapped by Boko Haram last month from the Kummabza village in northern Borno state have escaped from their captors and returned to their village. Boko Haram is still believed to be holding about 200 schoolgirls abducted April 14 from a boarding school in the town of Chibok. July 17-20, 2014 – Boko Haram raids the Nigerian town of Damboa. By the time the raid ends, 66 residents have been killed and more than 15,000 have fled. October 16, 2014 – The Nigerian government announces it has reached a ceasefire agreement with the Islamist terror group that includes the promised release of more than 200 kidnapped schoolgirls. November 1, 2014 – In a video, the group’s leader denies the Nigerian government’s claim of a ceasefire. January 3, 2015 – A multi-day raid begins, where hundreds of Boko Haram gunmen seize the town of Baga and neighboring villages in northern Nigeria, as well as a multinational military base, leaving bodies scattered everywhere and as many as 2,000 people feared dead. January 10-11, 2015 – At least 20 are killed and 18 injured in Maiduguri after explosives strapped to a girl are detonated at a marketplace screening checkpoint. At least three are dead and 43 injured after two suicide bombs, strapped to girls, detonate in a mobile phone market in Potiskum. Boko Haram is suspected as being behind the attacks. March 2, 2015 – Boko Haram releases a video showing the apparent beheadings of two men they suspected of being spies. March 7, 2015 – In an audio message purportedly from Shekau, Boko Haram pledges allegiance to ISIS, the Islamic militant group which controls areas of Iraq and Syria. Boko Haram is named “Wilayat Gharb Afriqiyya” or “Wilayat Gharb Afriqiyyah,” which means the Islamic State of West Africa. March 12, 2015 – In an audio message purportedly from an ISIS spokesman, the group announces that the caliphate has expanded to western Africa and that ISIS leader Abu Bakr al-Baghdadi has accepted Boko Haram’s pledge of allegiance. On the same day, ISIS blows up the Iraqi army headquarters north of Ramadi, killing at least 40 Iraqi soldiers. April 25-26, 2015 – The decomposed corpses of at least 400 men, women and children are found in shallow, mass graves and on the streets of Damasak in northeastern Nigeria. Due to a joint Nigerian-Chadian military operation, the town has recently been freed of Boko Haram, which seized the town in November. April 28-April 30, 2015 – Nigerian troops rescue about 450 women and girls in the Sambisa Forest during a military operation centered around destroying Boko Haram camps and rescuing civilians. According to the military, none of those rescued have been identified as the Chibok schoolgirls kidnapped last April. July 1, 2015 – Boko Haram militants raid three villages in the northeastern Nigerian state of Borno, killing at least 145 people, according to witnesses. September 3, 2015 – An estimated 30 people are dead and 145 injured after Boko Haram militants attack a crowded market in Kerawa, Cameroon and an infirmary near a Cameroonian military camp, according to Cameroonian military spokesman Col. Didier Badjeck. September 23, 2015 – 241 women and children are rescued and 43 Boko Haram militants are arrested after the Nigerian military raids camps run by the terrorist group in two villages. February 2016 – Militants from Boko Haram attack two villages in northeast Nigeria, killing at least 30 people. In another attack, two female suicide bombers kill 58 people at a Nigerian refugee camp for villagers fleeing terrorism. A suspect in the attack on the camp tells officers that she and the two suicide bombers were dispatched by Boko Haram. May 17, 2016 – Amina Ali Nkeki, one of more than 200 Chibok schoolgirls kidnapped by Boko Haram, is the first to be freed after two years in captivity. Nigeria’s army says she was rescued by army troops, but a witness tells CNN the girl wandered out of the Sambisa Forest in the northeast of the country along with her child and a man. August 3, 2016 – ISIS publication al-Naba says that Sheikh Abu Musab al-Barnawi is the new leader of Boko Haram. A Boko Haram insider confirms to CNN that al-Barnawi, the son of the group’s founder – who was killed by Nigerian security forces in 2009 – is in fact the new leader. August 14, 2016 – Boko Haram releases a video of some of the girls kidnapped in April 2014 and demands the release of Boko Haram fighters in exchange for the girls. October 13, 2016 – Boko Haram militants hand over 21 Chibok schoolgirls to authorities after a series of negotiations with the Nigerian government. It’s the first mass release of any of the more than 200 girls and women kidnapped from their school in April 2014. November 5, 2016 – A Chibok schoolgirl carrying her 10-month-old son is found by the Nigerian army. January 5, 2017 – The Nigerian army says another missing Chibok girl and her six-month old baby have been located during an operation to arrest suspected Boko Haram terrorists. January 17, 2017 – Scores of people are killed when a Nigerian fighter jet mistakenly bombs a camp for the internally displaced during an operation in Rann against Boko Haram militants, according to Nigerian officials and the Red Cross. The Nigerian government provides no official death toll, but humanitarian aid group Doctors Without Borders says “about 90” people died. May 6, 2017 – Eighty-two Chibok schoolgirls are released after negotiations between Boko Haram and the Nigerian government.